We all have our different hidden talents in this life. Some people are really good at spitting gum in the air and catching it in their mouths (looking at you, Selena Gomez). Some are absurdly flexible. And some people, like Andrew Garfield, can do backflips. Then there are people like this dude, who can literally trot down a flight of stairs wearing rollerblades. 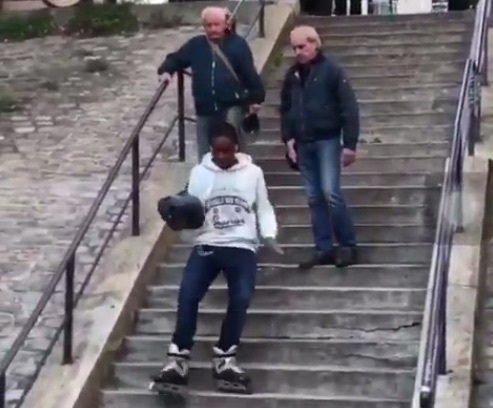 In a new viral video making the rounds on Twitter, you see a man on an outdoor flight of stairs wearing rollerblades. Before you can blink, he is suddenly running down said stairs while still in said rollerblades. The execution is so flawless and so casual. And he ends the feat by flashing an “ok” hand symbol just to showcase how easy this superhuman act was for him. Incredible. Twitter user @MinaMayweather posted the video on Friday, January 12th, and it quickly racked up more than 8.7 million views. As of this writing, no one yet knows the identity of this very talented and polite man (he turns to apologize to the older men he passed on the stairs). But rest assured, if we trust in the power of Twitter we will soon find out his name. That way, he can be awarded many, many medals for advancing travel. Meanwhile, many of those 8.7 million viewers were losing their minds over the video. Some users got too real about what walking down the stairs is USUALLY like, without the complication of rollerblades. Though this act of valor seems difficult to pull off, it does make us want to dust off our old rollerblades from the garage. Our Rocket Power-era dreams have been reawakened.